Lauren is now my lone little one at home. Having just one child with me most the day is simultaneously strange, heartbreaking and awesome. 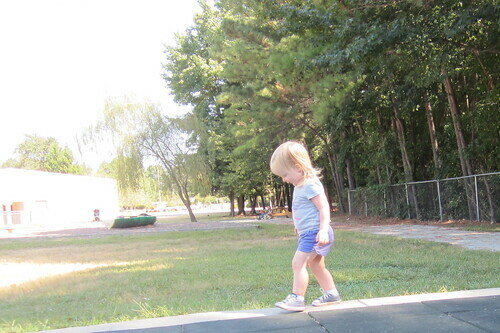 I miss her brothers, but I also enjoy the slower, more peaceful pace of my days with her. 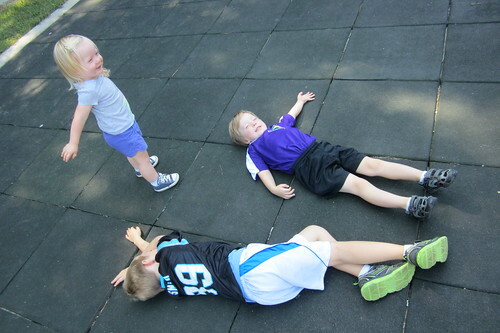 They are an especially nice counterbalance to our afternoons and evenings, which involve a lot of running around between my radiation treatments, school pick-up, dinner and the boys' soccer practices. On one of our first just-the-two-of-us days, I wanted to vacuum the dining room where Lauren was coloring at the table so I asked her to go play with some toys in the other room so the noise wouldn't bother her too much. And she said "Okay!" and went and quietly played with superheroes for the next half hour or so. I didn't have to intervene and remind anyone to take turns or that siblings aren't for hitting. And though I wondered how Evan was doing at school, I also thought, Wow, this is nice. I guess the best way to describe how our first few weeks together have felt is quiet. Lauren enjoys reading together and helping me wash dishes (playing with water in the kitchen sink) and asking me to watch as she hops like a frog. She even seems to like cleaning up toys, provided we sing a little song while doing it and she's, you know, finished playing. Lauren's also very content on her own, playing with her animal or superhero toys, looking at her books or coloring. (Lately she's enjoyed soliciting high-fives for "drawin' a picture!") Right now her favorite toys are two small, rubbery lizards, the kind you can buy by the pack at the dollar store. There's a red one and a green one and they run around together, playing and talking. Almost always, one is a mommy or a daddy and I'll catch myself running in from another room to check on her because I hear her saying "Mommy, Mommy, Mommy!" only to realize it's just a lizard talking--to his mommy. Our mornings involve mostly smooth transitions from school drop-off to our morning walk to running errands and then to lunch and nap time. But sometimes I break the peace by not adequately appreciating her independence. 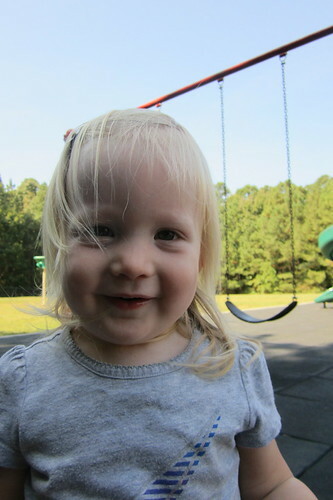 It might happen if I put her in her car seat when she wanted to climb in by herself. She'll start yelling "My turn! My turn!" and if I don't reverse course quickly enough, she'll fall apart and I just have to wait until she's ready to forgive me. She uses "My turn!" to let me know when she wants to do something by herself--walk up the stairs, climb out of the bathtub or take off her own shoes--and then has funnier variations for handling her own yogurt tube ("My squish it!") or, my favorite, ringing the door bell ("My ding dong!"). 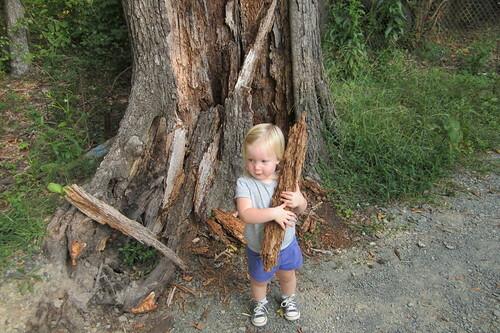 Lauren likes to pick up heavy things--say, a chunk of a fallen tree trunk--and tell us, "Look, I big strong!" She's also working on introducing herself. When I ask her name and age, she cheerfully replies, "I Yaya Smiff, I two!" The other day Matt was telling us he missed us while he was at work and without missing a beat she said, "I missed you too, Daddy." 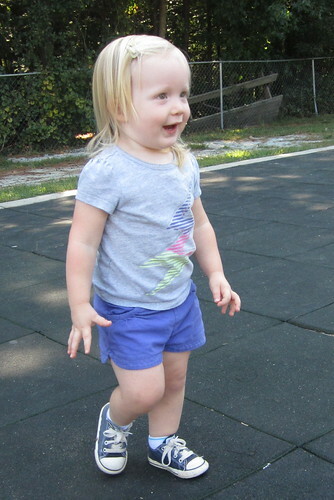 How quickly my baby is becoming a precocious little girl. Most mornings, she whines that she wants to go to school too and often insists on carrying her backpack to drop them off. On Evan's first day of school, as Lauren and I walked out of the school building, some of the teachers in the car pool line noticed her backpack and one of them asked her, "Are you ready for school too?" And in a rare shy moment, she turned away, grabbed my leg and then looked up to me and asked, "Mama, hold you?" I gladly obliged and took heart that she's mostly content to be my constant companion . . . for now.